Reliable Sources videos: Ailes, the White House, and more. Profile: Larry King (via TVN). Q&A: Soledad (via ICN). News Watch videos: Sequester blues, busting the filibuster. Latest Olby filing slams Current TV. Sunday talkers: preview. Sunday specials: Myths, Lies, and Complete Stupidity; Escape Fire. Concha: MSNBC and CNN ego trips are driving their viewers to Fox. Reliable Sources videos: Hillary, Geraldo, and MSNBC editing. Harris: CNN may oust ‘respected journalist’ Soledad O’Brien. News Watch video: Another editing controversy at MSNBC. Today’s Steve Capus specularama: Joining Zucker at CNN? Video: Greg Gutfeld complains about The Five to Andy Levy. Flip-flop: MSM now encourage Murdoch to slant FNC coverage. CNN wanted to hire Olbermann?! Sunday talkers: preview. Profile: Dr Sanjay Gupta. Video: Sanjay w/Conan part one, part two. The Five video: Who is responsible for student loan debt? Demo derby: MSNBC wins 25-54 primetime for the week. Lean Forward: MSNBC signs Olbermann amigo as contributor. VIdeo: Rick Reichmuth goes over a non-fiscal cliff. Q&A: Gutfeld. Zucker severs Couric ties. ICN: CNN plans beget ‘abject horror’. Zucker talk: tells Kurtz ‘more passion’; speaks of ‘endless potential’. Video: A War on Christmas rumpus…Bill O’Reilly vs Lincoln Chaffee. Major Garrett resurfaces…but not at Fox. Flashback. Reliable Sources videos: Petraeus, Benghazi, and more. Today’s example of...Who is the real news channel? News Watch video: Benghazi coverage...spin or facts? Video: Andy Levy ombudses Benghazi, Twinkies, and more. Sunday: Fox Files special. Sunday talk: tip sheet, HP recap. Video: Chris Matthews with Jay Leno part one, part two. Romenesko: Why did Ailes talk to tvnewser? Olby resurfaces. Lean Forward: Obama meets with MSNBC host for fiscal advice. The Five video: Are the media abdicating their responsibilities? Tuesday’s numbers: O’Reilly-Hannity-Baier 1-2-3. MS demo strong. 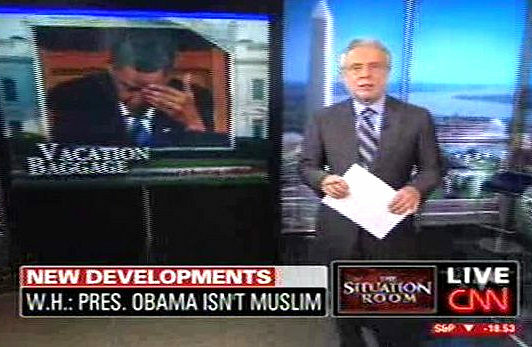 Lean Forward: MSNBC aired Obama clip before they didn’t! Red Eye video: Andy Levy ombudses the Romney video. Roeper: The real punk in the Fox & Friends prank. Ainsley update. Video: Did Olbermann send this email to F&F? Melissa in Houston. Q&A: Soledad, Tamron Hall, MSNBC ‘crack talent’. Profile: The Rev. 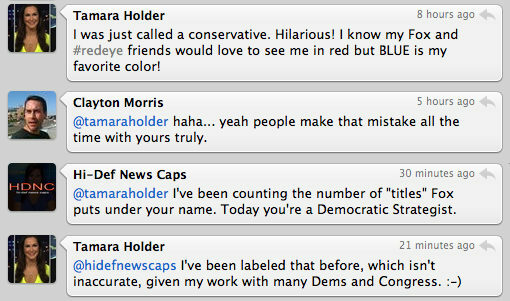 Paging Maddow: Another MSNBC contributor raising money for Dems. The Five video: Is the WH revising history? Piers plummets: lowest in 15 years. Weekend numbers. Cable newsers flock to Women in Media fete. How Beck bests Olbermann. Gasparino: Man of the Year. Faber didn’t lose on Jeopardy! The striking Erin Burnett. I’m ‘the conscience of Fox’, sez Geraldo to...Media Matters!? MSNBC: The Place for Badminton? Maddow lawsuit update. Video: Greta with Jake Tapper et al part one, part two. Reliable Sources videos: Afghanistan, UBL, and more. 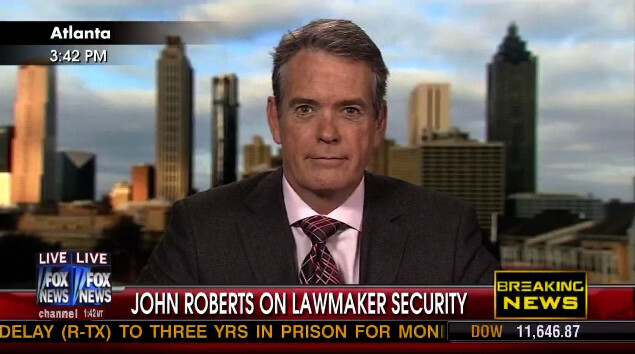 Fox News Watch video: Obama’s UBL anniversary. Current proves they can go lower than Olby (via NB). Video: Coop with Letterman. Alan still gets hate mail. Why CNN is terrible. CNN reporter ‘soliciting bribes’? Sunday talk: preview, tip sheet, HuffPo recap. Greta accepts. MSNBC fires Pat! Buchanan: I’ve been blacklisted. Analysis. Suppose CNN holds a debate and nobody shows up? Schaeffer: Why Judge Nap’s Freedom Watch will be missed. Olbermann vs Breitbart: Fishbowl DC calls it for Breitbart. 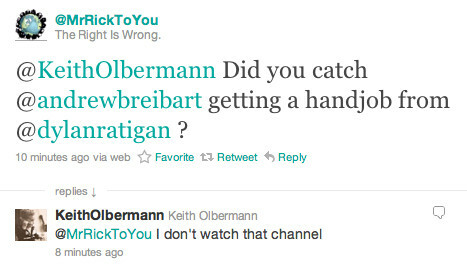 Mediaite’s Christopher defends Olby, as Breitbart posse redoubles their Olbermann slams. Cal Thomas to Maddow: Let’s do lunch. 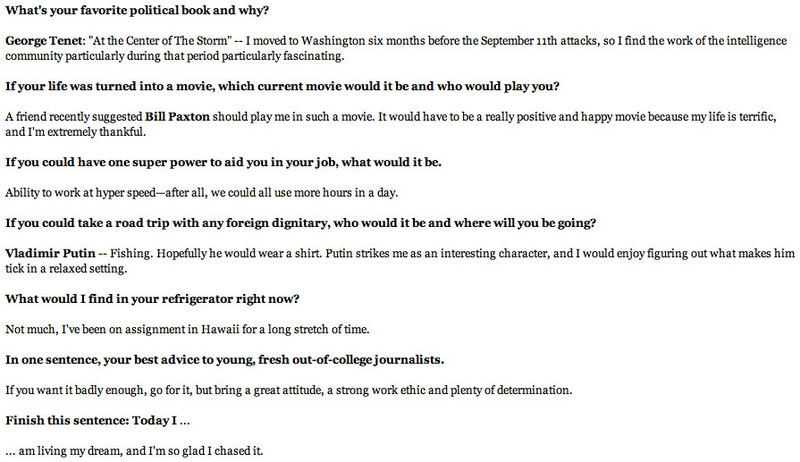 Q&A: Harris-Perry. VIdeos: Bill O’Reilly on Today and Fox & Friends. CNN temp sets. Propagating propaganda: from Media Matters to MSNBC airwaves. The Five video: The Constitution don’t get no respect? It’s a Roger Ailes book boom. Is Olbermann hanging by a thread? New Pew: Cable channels take the lead for campaign news. MSNBC, FNC viewers most politically knowledgeable. Analysis. Weekend numbers. Michael Barone in Peoria. Caucus coverage. Video: Red Eye five-year anniversary retrospective part one, part two. Q&A: Neil Cavuto, Liz Claman. Dylan Ratigan’s anger management. Wemple: Roland Martin hasn’t been anti-gay on CNN so he’s ‘clean’? Video: The Five on Happy (and Unhappy) Meals. November program ranker: FNC holds the top 13 slots. O’Reilly bumps Rizzoli ratings, tops BriWi’s Rock Center! ICN: Who’s leaking Imus numbers, and why? November: HLN slumps, Imus demo down as totals rise, CNBC daytime growth, Piers down, The Five up. November spin: CNN, MSNBC. CNNi drops two shows. Video: HLN lets Ann Coulter say what MSNBC bleeped. Another Olby twitter boycott? Here’s what set him off this time. Jenna Lee gets ready for her close-up. Video: Matthews w/Colbert. Lewis: MoJo and me. Ad Age: FNC may see an election-year windfall. Rob Marciano’s a new father. Today’s Piers PR stunt. Kessler: The Five shows why Fox News is a success. Video: Chris Wallace with Imus on Penn State and more. Video: Dana Perino demonstrates how she gives The Look. Q&A: Greg Gutfeld on Red Eye’s best ratings ever. Video: Bias Bash on freeing captured terrorists. Coop and Zucker expound on cable news. Video: Wiehl and Imus discuss Beck and Bachmann. Q2 program rankers. Olby trumpets O’Donnell slippage. When Larry meets Harry. New CNN intern arrives. News Corp apps top iPad charts. O’Reilly vs autobots. Video: Wallace questions Bachmann, apologizes for ‘flake’. Video: Reliable Sources on Olbermann and Stewart/Wallace. Chris Wallace: Hey Jon, the joke’s on you. Hot & Not: Ed Henry, Diaz-Balart, Olby’s war etc. Video: News Watch on Afghanistan coverage; more. R.I.P. : Nick Charles. Reena Ninan: Woman on the front line. Sunday talkers: preview, tip sheet, HuffPo recap. CNN pychics. Slate: New Countdown juggles eloquence with strident bellowing. Zurawik on Olbermann week one: smooth, rude, divisive. Barnicle, Bulger’s best bud. Q&A: Jenna Lee. Mika flashback. Poniewozik: Olby’s score-settling. Is Alisyn ready to move on up? Party w/MSNBC. CNN in (the other) Georgia. Dana Bash abortion flap. Goetzi: Is Huntsman trouble for cable news? 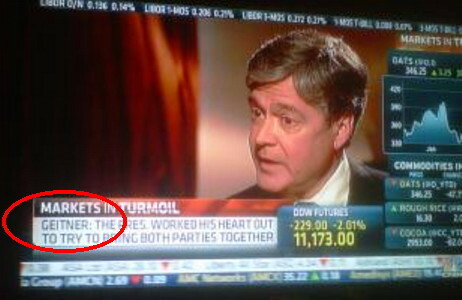 Bloomberg vs CNBC. Video: Bias Bash questions Media Matters’s tax-exempt status. Zurawik: Hey Olbermann, how about some ratings transparency? Videos: Janice Dean on Today, Mika on ABC. Ed Henry’s other role. A dozen cablers named to distinguished list. Cablers cover Casey. 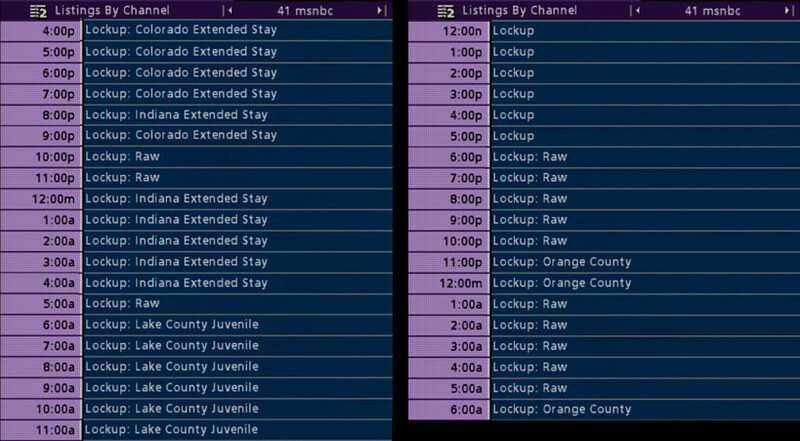 Least wanted: pre-Olby Current cable’s lowest Nielsen-rated channel. Current claims Countdown pulled 179K demo viewers. Bias Bash videos: Africa/Afghanistan and NBC’s pledge edit. Bloomberg/Comcast channel spat marches on. Julie Banderas back in the anchor chair? Weekend numbers. Video: Juan Williams with Don Imus on Jon Stewart, Libya, etc. That was fast: Media Matters launches instant war against Ed Henry. Video: Bernard Goldberg on NBC’s pledge, CBS’s Norah O’Donnell. 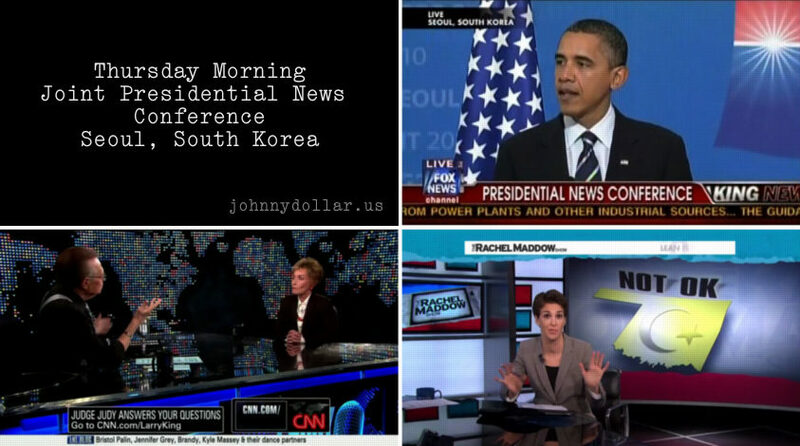 ICN: Why 63 minutes means Olby’s declared war on MSNBC; more. Countdown reax: Zurawik: ruined by Markos; EW: fawning; LA TImes: effective; Perpetual Post: glad he’s back; The Cable Game: yawn; WaPost: sleepy; Salon: welcome back; Daily Beast: marred by nastiness; The Wrap: boring, pompous. Van Jones calling for prior restraint of Fox News speech. ICN: No Countdown coverage for us. 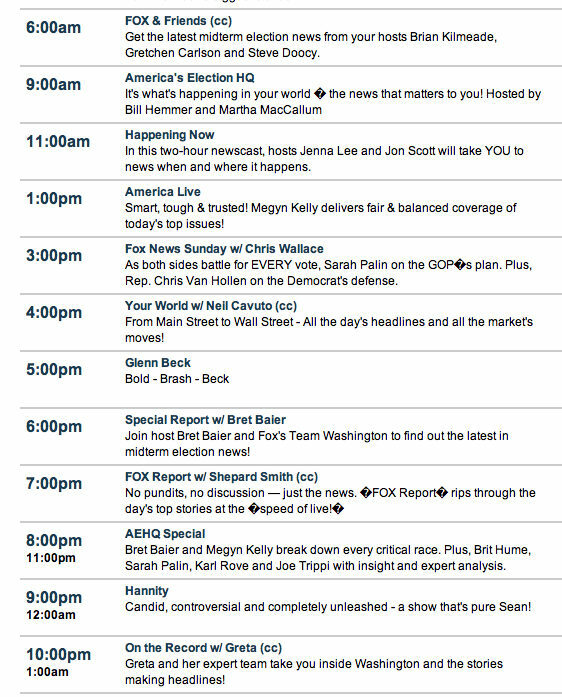 O’Reilly/Fiasco preview. Ed Henry leaves CNN to be Fox News Chief WH correspondent! Hall: Why do top talents keep leaving MSNBCNBC? Audio: Bret Baier reacts to the Jon Stewart interview. Zurawik: Stewart flounders under Chris Wallace questioning. MSNBC, the Place for Progressives. Velshi’s early call. Q&A: Bret Baier (via TVN), Baier, Nicole Petalides, Petalides. Stelter: Olbermann boasts he’ll take MSNBC’s viewers. Hot & Not: O’Donnell, Olbermann, Weinergate, etc. America’s Most Wanted may be moving...to FNC! Norah O’Donnell quits (MS)NBC for CBS News; analysis. 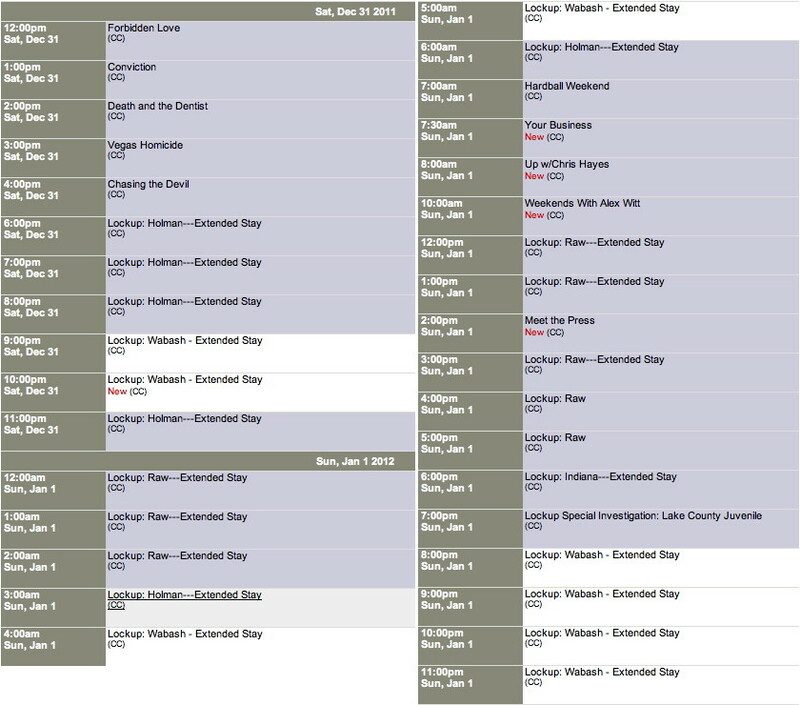 Tragedy strikes Contessa Brewer (via ICN). CNN Sunday special: digital roots of the Arab Spring. Weiner’s next job: with CNN, CurrenTV, or somewhere else? Video: Chris Wallace w/Imus. Audio: prepping for Stewart. Q&A: Mika, Chris Matthews. Video: Olbermann w/Colbert. Funt: Too much debate gimmickry. CNN sued...over captions! Discovery CEO slams Liz Claman, then goes on her show! A month off air and off twitter...wherefore art thou, Juliet? Bauder: Coop’s ‘honesty’ stratagem paying off. Bias Bash video: ramifications of Palin email crowdsourcing. Tension at CNN: Jautz vs Whitaker, who’s in charge? Video: Trump unfazed by Matthews ‘backward’ crack. Zurawik: He’s reckless, rude, and paranoid...guess who? Joe to NY Post: You’re lying! Rehab for Kurtz and Toobin? Controversy swirls over CNN debate exclusion. 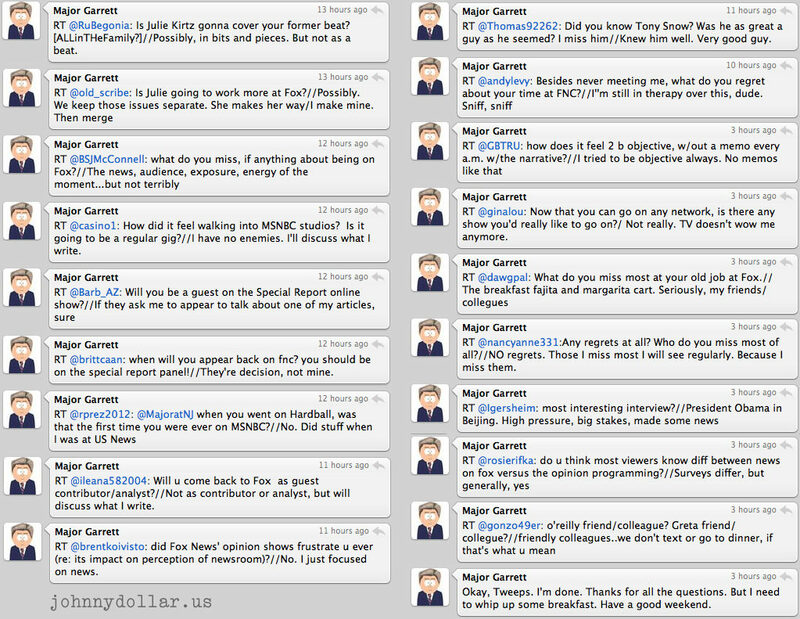 Twitterama. Casey Anthony soap opera resuscitates ratings at HLN. Video: Reliable Sources talks Weiner w/Kirsten Powers. Joe & Mika angling for CNN slot? 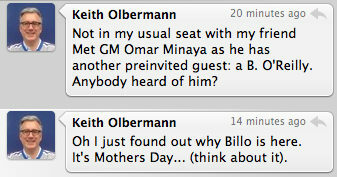 Olbermann’s eloquence. Video: News Watch on Weiner’s confession and ‘treatment’. Video: CNN debate preview. 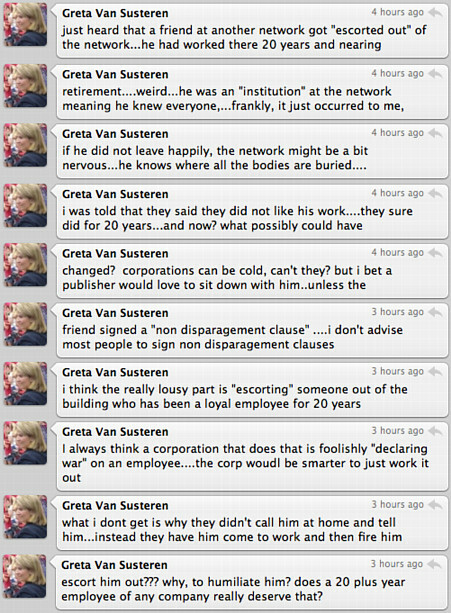 Greta: journo or talker? Tracton: How a one-hour CNN interview shrunk to five minutes. Q&A w/slideshow: Rick Reichmuth and the MS flooding. Chris Licht leaves MoJo for CBS. Video: Bias Bash on covering Obama’s Mideast speech. Video: Olby w/Letterman. Gore: Rupert stifling CurrenTV? Joe & Mika call Trump. Juan Williams in Wheeling. Markos, banned from MSNBC, to be Countdown contributor. Video: Bias Bash critiques 60 Minutes Obama interview. Elites gather for Mika soiree. Last names can help. Audio: Around the world w/Bill Hemmer. Q&A: D-Rat (v/TVN). 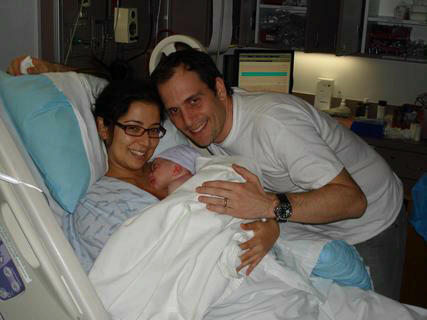 Adam’s big day: May 14. Big Ed sued. Meade hosts concert. Do CNN gains worry the competition? Weekend numbers. Olby reveals the one and only purpose of government. Bias Bash video: Top ten UBL themes and memes. Today’s firing demand. Q&A: Liz Claman. Coop pranked. Video: O’Reilly challenges NY Daily News over Trump slam. Diane Macedo takes over newsreader slot on Imus. Q&A: Willis, Thomas Roberts (v/ICN), Maddow (v/Mediaite). Who wants to work for Olby? The obligatory denial. CNNMoney gets an extreme makeover. Licht move stirs MoJo speculation. Todd loses Savannah. Video: Trump bloviates on UBL, racism charges. Profiles: Jennifer Griffin, Mrs Bill Hemmer (via TVN). Hot & Not: UBL, The Donald, the debate, CNN being petty. 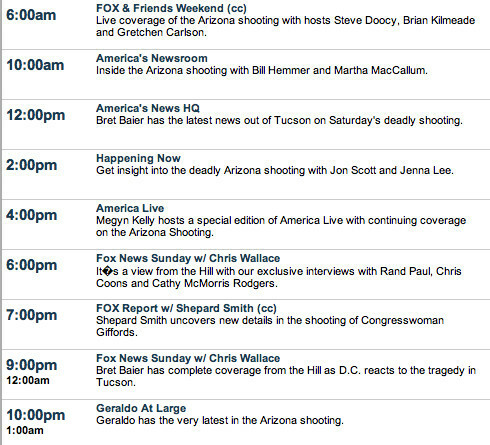 Fox News top-valued non-sports channel. Olbermann plans website, claims: ‘I’m in charge’. Zurawik: Good, bad, and ugly of Wisconsin coverage. Audio: John Gibson opens up about his skin cancer. Bias Bash video: Comparing Wisconsin to Egypt. Michael Ware has left CNN. MSNBC snags Gracie. Kirsten Powers fan sends her a tweet. Video: Bernard Goldberg on George Soros vs Fox News. CNN’s Wedeman first Western journo in Libya. Zurawik: Hot-dog poseur O’Donnell’s desperate ploy. Monday’s numbers: Bill-Hannity-Bret 1-2-3. Weekend numbers. Q&A: Major Garrett on Olby’s exit, Velez-Mitchell pt deux. New Pew: Egypt coverage analyzed. Video: Ashley Webster w/Imus part one, part two. Morning Joe’s music mavens, CNN’s iReport awards. O’Donnell adopts Olbermann’s shtick, rips O’Reilly. Chris Jansing joins Jack Jacobs in VietNam. Video: Greta’s unedited interview with Donald Trump. Greg Palkot hears from doctor who treated him in Egypt. FBN’s Ashley Webster survives Cairo scare (via TCG). Cablenewsers to gather for NLGJA benefit. Video: S.E. Cupp w/Don Imus part one, part two. Coop in Naples. Q&A: Juan Williams, Velez-Mitchell. Licht to Bloomberg? CNBC skeds currency show. With ‘wild card’ Olby on board, Current widens its web. Video: Reliable Sources on AOL/HuffPo. Video: Fox News Watch on AOL/HuffPo and Olbermann’s move to Current TV; plus how Obama views Fox News. Q&A: Joe & Mika in Chicago. Cablenewsers scramble to cover surprise resignation. Olby gets nightly primetime hour, twitter explodes. Current’s eclectic lineup. Will KO help or hurt Current’s bottom line? Video: Pinkerton’s take. Olbermann to join cablenews powerhouse. Why it makes sense for both parties? Non-compete clause may not apply. John King complains about FNC’s contributors. Coop leaves Egypt, heads for Letterman’s couch. Nic Robertson’s wife Margaret on the Egypt experience. Lawrence O’Donnell struggles to retain viewers. Man bites dog? HuffPo criticizes Olbermann. Whoops, that didn’t last long: HuffPo pulls the post! Coop to interview Chilean miners. Video: Reliable Sources on the platforms of Palin. Murdoch and Apple prep iPad newspaper. Video: Fox News Watch on Koppel vs cable. Big audiences for Bret Baier. Did Scarborough get a raw deal? The Krak leaves Mediaite for CNN’s Morgan. Kurtz: Civil war at MSNBC leaves Olby without allies; more. Olbermann response: a non-denial denial. Video: Are my testicles black? Friedman: What will Comcast do with Olbermann? More. KO to lecture Ted Koppel about journalism. Hot & Not: Olby, Maddow, Dobbs, Tucker, missile mirage, etc. An MSNBC mystery: who said it? Swells swarm to Soledad’s soiree. Video: Fox News Watch on Bush’s book tour; more. Bill O’Reilly in Palm Beach. Is Mario Cuomo boycotting CNN? Prolific pundit: 12 appearances in 14 hours. Sunday hosts gather. Sunday talkers: tip sheet, HuffPo recap. Olbermann issues ‘apology’ while blasting MSNBC: analysis. Friday’s numbers: Bill-Bret-Beck 1-2-3. 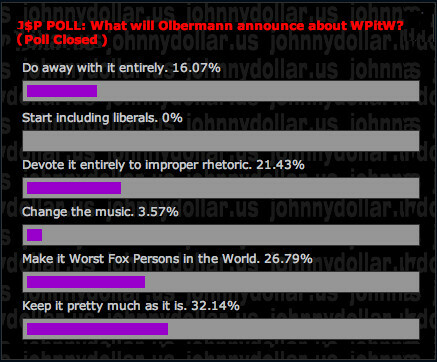 Irony: Countdown without Olbermann up 13% from 10/29 Countdown with Olbermann. Grace under fire no longer. CNN’s Abbie Boudreau has left the building. Report: MSNBC apologized to Keith?!? More. KO flashback: office election pool ‘conflict of interest’. Zurawik: Olby ‘suspension’ a joke. Should KO resign? The progressive wing of the MSNBC party. A genius ratings ploy? Will he say it? KO: most powerful man at MSNBC? Scarborough distanced himself from MSNBC’s election night. Mike Emanuel: Beck, Olby, political donations. Q&A: Richelle Carey. Hot & Not: Olbermann, Maddow, FNC, the matrix etc. Mag turns Gretchen Carlson profile into hate-Fox fest. Olby tweets: a sign ‘suspension’ to end soon? Yes: KO back Tuesday. Olby suspended on refusal to apologize on air: a game of chicken. Is the whole thing an elaborate publicity stunt? Q&A: Jonathan Wald. A tribute to the King. Video: Reliable Sources on Stewart rally, midterm coverage. 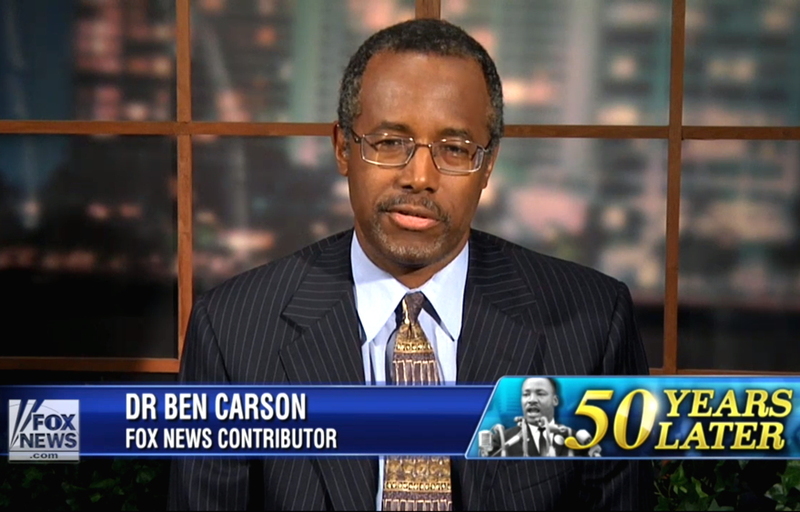 Video: Fox News Watch on 2010 election coverage. Zurawik: Maddow’s petulant pout of false self-importance. Mediaite: KO supporters argue irrelevancies. Flashback: Olby on Juan Williams (h/t jtLOL); more. KO suspension ignites debate. MSNBC at a crossroads. Guardian: back him, don’t sack him. Malkin: No freaking way! Top ten Olbermann replacements. The Wrap: no donations found for FNC on-air journalists. Maddow defends Olby: he broke the rules, but it’s Fox’s fault. Video: Bill O’Reilly with Bill Maher. Election night at Fox News. Tuesday’s numbers: an FNC blowout! FNC tops NBC-CBS-ABC coverage! Ailes sends congratulary memo. Zurawik: MSNBC fear mongers, debases the term ‘anchor’. Demeaning interview? So sez not the subject, but the interviewer! Video: Top five apocalyptic MSNBC moments. Audio: Chris Wallace reacts to Chris Matthews. Coverage reviews: chaotic sense, lots of metaphors, FNC standout. Mediaite: Fox fair and balanced, MSNBC not. ICN: When pundits run wild. CNN: one analyst for each viewer? Big loser: CNN’s matrix. Behind the scenes at CNN, MSNBC. Mediaite: Phil Griffin asked for examples, he got ‘em. CNN: Heroes update; into the matrix; missing Brooke. 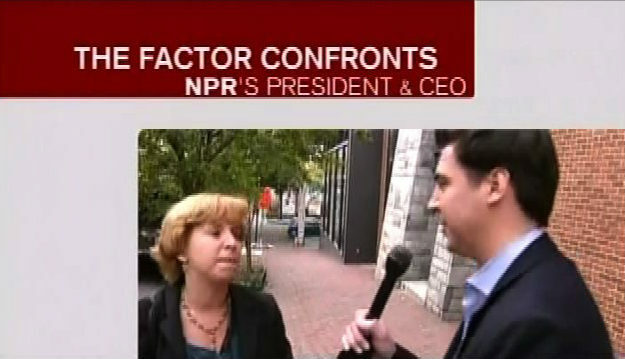 Inevitable: Jesse Watters ambushes NPR CEO. Preview. 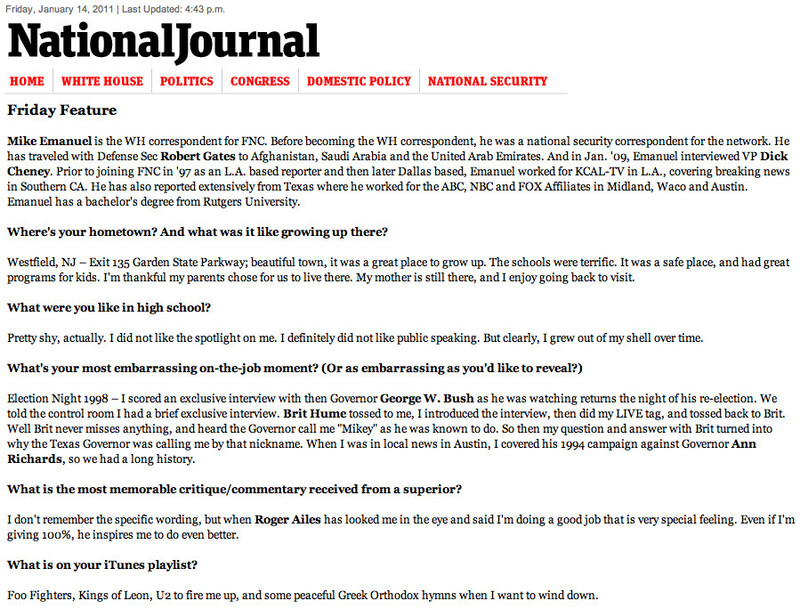 Major Garrett talks Juan Williams. TCG: Et tu? CNBC Remington documentary raises eyebrows. Surprise: Olbermann attack turned out to be false. 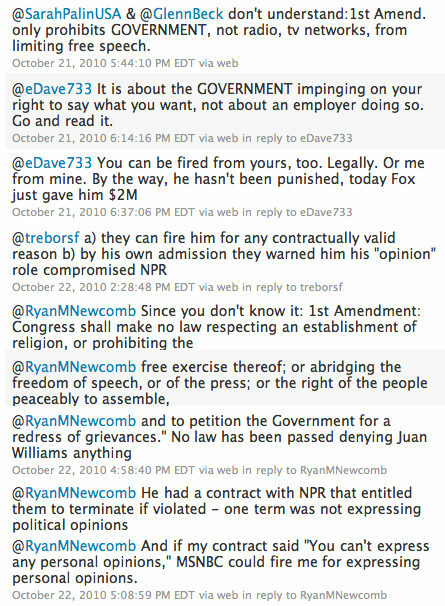 NPR CEO apologizes...but not to Juan Williams. NPR affiliates voice discontent over firing. Blame Uranus! Hot & Not: Juan Williams, Phil Griffin, ad wars, Abrams, Maddow. Hitchens wants CNN to re-hire Rick Sanchez! Fox live streaming CT Senate debate w/Bret Baier. Park & Spit pre-taped segment already online. CNN’s Cal Perry has left the building. Charlie Gasparino makes top biz commentators list. NY Daily News slams Spitzer: a ‘disgrace’ (via C-boomer). CNN’s Kurtz profiles Park & Spit. Q&A: Spitzer (Mediaite), Park & Spit (TVN), Park & Spit (HuffPo). Cable news bloodsport: Olby claims CNN tried to hire him; MSNBC’s twitter rule; Olby/Joe tensions; the Campbell Brown experiment; more. O’Reilly/Nolan/Comcast flap rehashed; Olby quoted. Hot & Not: Sanchez, Coop, O’Donnell, Allred, EEOC, Shultz. Profiles: Gerri Willis, Robin Meade. Q&A: Sanchez pt one, two, three. Monday’s numbers: Bill-Beck-Bret 1-2-3; townhall. Weekend numbers. Wolf to moderate Delaware Senate debate on CNN. Again? Scarborough needles Schultz, Olbermann. Fox Business shuffling its daytime lineup: details. Michael Ware: CNN spiked video of Iraq war crime. Q&A: Fareed Zakaria. Profile: Betty Liu (via ICN). Nylon magazine Fox & Friends profile [pdf]. Lynne Russell, Jodi Applegate & Lauren Sivan resurface. Will media obsession Christine O’Donnell go on The Factor?